Uber has announced it is eliminating the position of autonomous vehicle operator and has laid off around 100 such jobs shortly after a fatal crash in Pittsburgh, according to reports. The company announced around 100 autonomous vehicle operators are to be replaced, with former employees offered a severance package or 55 ‘mission specialists’ roles, which they could apply. These specialist roles would be trained in both on-road, more advanced test-track operations, and are expected to provide more technical feedback to self-driving car developers. Operators have been told they are ‘free to apply to other roles at the company’ and could apply for the mission specialist position, as the company said it was eliminating the autonomous vehicle operator role. A Tempe police report concluded the crash was ‘entirely avoidable’ and footage from inside the vehicle appeared to show the driver was distracted at the time. Missy Cummings a professor at Duke University argues the danger of self-driving technology is humans monitoring the automated systems are ‘likely to become bored and disengaged’, adding this may have happened in the crash as ‘this safety driver was not doing any safety monitoring’. Uber suspended driverless-car testing at all sites—Pittsburgh, Tempe, Toronto, and San Francisco – after the crash on 18 March and in late May shut down its driverless cars tests in Arizona, laying off around 300 people. 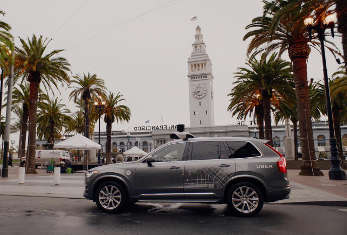 Uber said it ‘hoped to resume self-driving operations in Pittsburgh in the summer’ which was the earliest sight of Uber’s self-driving schemes, much to the disapproval of the Pittsburgh mayor who claimed the company did not inform him of its plans. Uber’s autonomous vehicle operators originally worked in pairs, but around November 2017 the company switched to having a single operator per vehicle, a source told the media. The source also stated it to be a ‘cost-cutting measure’.